Despite not loving the fact that I have to go to ‘school’ every Sunday, learning new tips and tricks, and working on my knife skills is enjoyable. Most importantly – I get to sample amazing food by wonderful chefs… if only my Healthy Culinary Art class included desserts. Maybe next semester? My only criticism, is that these recipes have a number of ingredients. For instance, during out ‘soups’ class, we learned how to make a curried butternut squash soup. Typically when I make it, it only includes butternut squash, garlic, onions, cinnamon, and vegetable stock. The recipe that we learned in class included those ingredients plus curry, apples, coconut milk, lemon juice, honey, etc. It was delicious, don’t get me wrong, but whatever happened to the whole ‘keep it simple’ idea? Nevertheless, I probably will make the ‘soup-ed up’ (no pun intended) curried butternut squash soup during the winter – just to change things up a bit! Today, I made myself a salad for dinner (also learned in my HCA class), with a side of unhealthy chicken which a. I will probably make only once a year and b. made my Nike workout + run useless today. Preheat your oven at 350F. Mix the dressing ingredients and set aside. Trim and scrub the beets, cut off the top and bottom pieces and then cut the beet in half (lengthwise). With the flat side of the beet on your cutting board, carefully cut the beets into wedges. Place the beets on a cookie sheet lined with aluminium foil, and drizzle olive oil on top. Let the beets cook for about 40 minutes, they will be ready when they get soft and you can easily pierce them with a fork. While the beets cook, wash and dry the watercress. Using a pair of kitchen scissors (you can also use a knife), but off the watercress stems and discard – keep the leaves! Place the salad onto plate. 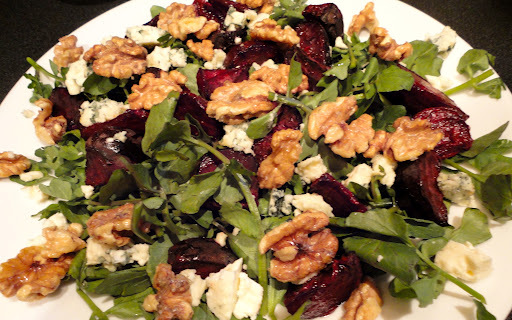 Once the beets are done, place them on top of the salad, and drizzle the dressing on top. Crumble some blue cheese on top, and garnish with walnuts*. *If you want to candy the walnuts, toss some maple syrup on them (and stir, making sure they are coated). Put them in the oven for about 10 minutes, as the beets cook.